TheSage's English Dictionary and Thesaurus is a one-click complete dictionary and multifaceted thesaurus of the English language. TheSage can look up words directly from almost any program (IE, Word, Firefox, Outlook, Thunderbird,... ) and is 100% portable. It runs locally, and does not use your Internet connection. The Dictionary comprises approximately 320,000 senses, 82,000 etymologies, 60,000 examples of use, and 140,000 phonetic transcriptions, encyclopedic information (geographical, historical, political,...), academic knowledge (medicine, biology,... ), and more. The Thesaurus encompasses synonyms, antonyms, hypernyms, hyponyms, meronyms, holonyms,... including nearly 1,400,000 relationships between definitions. 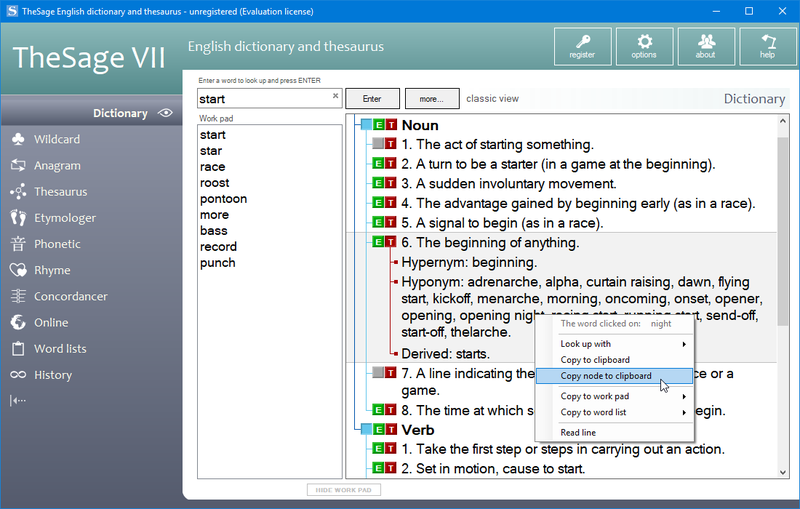 The essential functionality includes the following: Tabbed interface allowing multiple definitions and searches to be readily available, quick cross-referencing (any and all displayed words are clickable, triggering a lookup), standard and advanced wildcard search functionality, anagram search, online search, definition and example concordancer (so-called reverse search), text-to-speech, phonetic wildcard search, history, word lists manager, customization of the appearance of TheSage, and more. ArtCursors 5.28: You can find, create, edit, import, export cursors and manage cursor libraries 4Media ISO Creator 1.0.21.0827: Make all the contents of CD/DVD into ISO image files for backup Smart PDF Creator 14.4: You can batch convert all your printable documents to PDF format fast and easy. Soft4Boost DVD Creator 4.8.7.959: Create DVD discs with personalized chapters, menus, titles, music and effects.